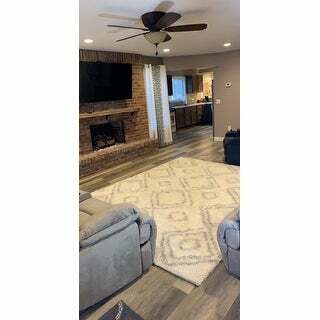 Love this area rug. Nice and thick. We bought this for our master bedroom and are thrilled with the quality. 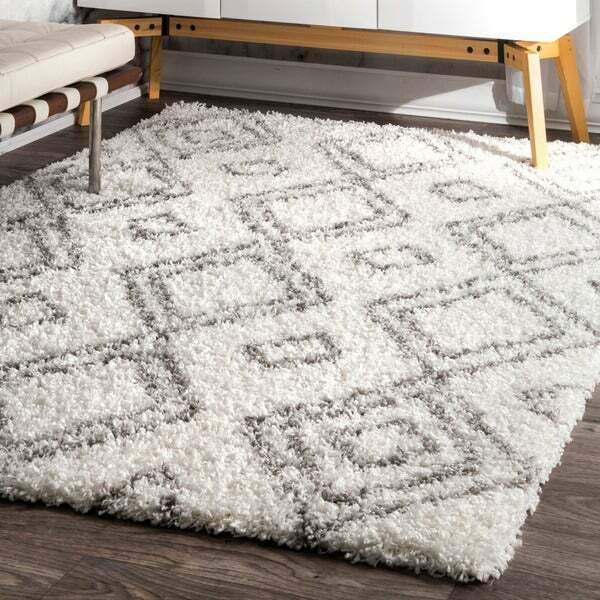 Bearing a pattern reminiscent of Moroccan Berber carpets, this shaggy trellis rug adds geometric flair to your home decor. The rug is made of polypropylene and the shag pile feels plush and warm underfoot. 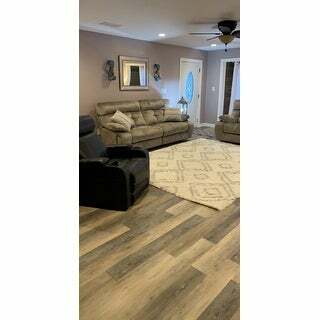 Although it's not the highest quality (not as thick and plush as other rugs), I think it looks VERY nice in my living room and I get lots of compliments. I couldn't find a better price for the size! It didn't take long to ship at all, and after receiving it, I just vacuumed it to make it fluffy and weighed down the edge that was tightly rolled for a couple days to flatten it (you can see in the picture I attached, it was barely rolling up on itself). All in all, I'm loving this rug. Perfect statement piece for my living room. 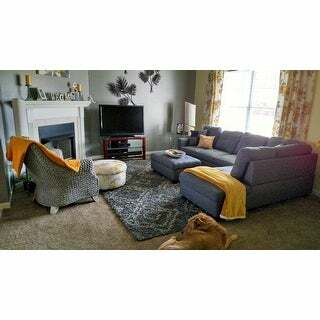 I am happy with the Moroccan look and how it lightened up and compliments my MCM decor. As other's mentioned here, the pile is not lush and thick but at this price, I wouldn't expect the luxury of a $$$$ rug. 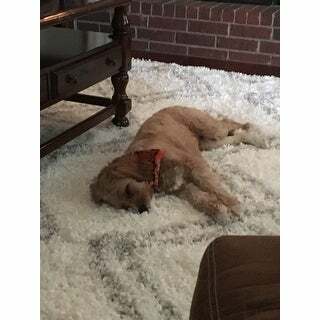 Found same rug at a home décor discount retailer for twice the price so knew what I was purchasing before placing the order. After vacuuming to pick up the pile after laying, the rug feels a little softer. The color is actually a winter white and not dead white and the "trellis" design is a warm grey (leaning toward the beige side). Overall, very satisfied with my purchase. Overstock delivery was very quick; less than a week after placing my order. I am afraid of geometric patterns on shag rugs. This one with grey and white is a total winner! I read some, quite frankly, ridiculous reviews on here prior to my purchasing this rug which almost deterred me from buying it but I am so glad that they did not. While some people say you can "feel the floor" underneath the carpet, that is sort of true, but what I feel first and foremost is the softness of the rug itself. I think it is super plush. It is just shag enough not to be overbearing, and honestly, for what the rug goes for I am surprised by the quality. It's a great rug. It's obviously not a Persian rug or an oriental rug but if you wanted one of those this wouldn't be your price point. 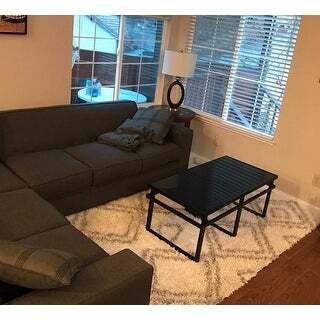 I didn't buy a rug mat because the rug is big enough to fit completely under my couch and my coffee table is on top of it as well so not much of it moves with the weight of those two items on top of it. The rug did smell a little bit like rubber when first opening it up, but that's par for the course and has dissipated a lot by now. Shipping was quick and easy too. Just make sure you measure correctly before buying which size you want. 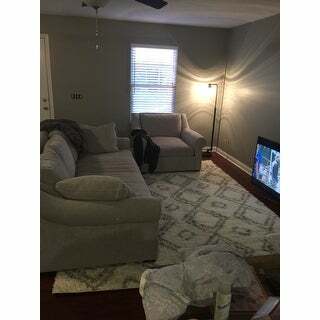 This rug is slightly bigger than I think we wanted but it's no sweat since we just have a lot more of it under our couch than we initially thought we would. Highly recommend. I absolutely LOVE my Plush Moroccan Trellis Shag Rug! It's so soft and plush! It gets so many complements! It's so soft, some guest want to sit on the floor on the rug instead of on the sofa! I'm sitting on my couch running my feet over my super soft plush rug right now! :) LOVE IT! This rug rocks! Love then feel and cool geometric design. It goes perfect with my grey color scheme. Rug came super quick. I use the attachments to vacuum as I don’t want to get the shag sucked up. The colors are true to the picture. The white is white and the grey is grey - exactly what I was looking for! It is very soft and my kids love to play on it. It is not a thick rug so you would definitely need a rug pad. I'm am happy with it, just wish it was a little thicker. Love it! There has been no shedding so far! I bought this rug along with the non slip rug pad and it does not move at all. The colors come as in the picture. I got the white and grey and it looks better in person. It is super soft! bought this rug for my daughter room and it is so soft on your feet. Just love it!!! 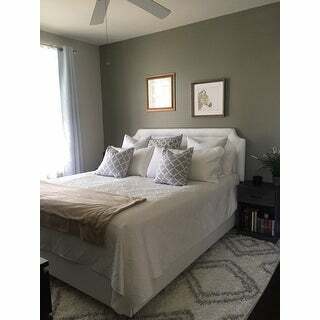 the color is white and grey which goes well with her room walls that are painted grey. It gives the room such a elegant touch. The carpet is easy to fluff, I take a broom to do the job. Love this rug! It's so comfy and I love the color and it's holding up well so far with three kids! I was worried when I purchased it that it may be poor quality, being so inexpensive. I was wrong! It looks great and definitely not like I only paid $175 for it. I definitely recommend this brand to anyone. Soft texture and great quality! Puppy approves too! 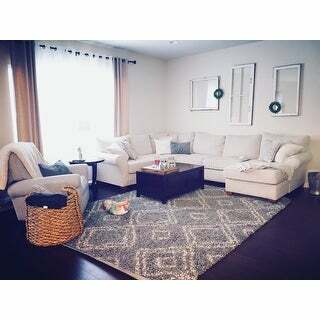 I teamed this with the new sectional I bought from Overstock. You be the judge but I love it ! I really like this rug. I ordered the 8X10, and think it was a great value. 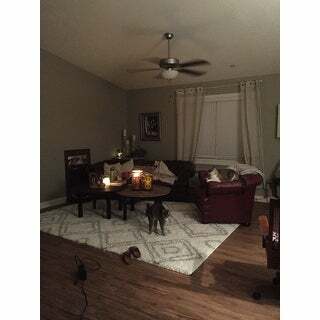 I love how it looks and feels in my family room. Very happy with this purchase. Glad I bought it! I purchased this size and a 3x8 runner on May 31, 2016. The color is a nice dark blue, somewhere between royal blue and navy blue. The pile is approximately 3/4", and lays down,the twist is loose and has begun to come apart at the ends. It gets very little traffic. When you run your fingers through the yarn or walk on it barefoot you can feel the roughness of the backing of the rug. If you vacuum daily, you see a defined design of the diamond shapes, but if you go a few days there is no definition. I gave it two points because I like the color and it serves its purpose, however, it won't last very much longer. BEST RUG ESP FOR ITS PRICE! Looks beautiful in our living room especially for the price! We love it! I am buying the runner and the opposite colors for my dining room today! I first bought this rug 5 years ago. After 3 kids wearing it down, I had to toss it. I replaced it with this same rug a week ago. 5 years ago, the rug came in perfect condition, smelling like new carpet. A week ago the rug came damp, smelling like chemicals and mildew. I immediately asked to return it and get a replacement. The replacement rug came a day ago... and it also smells very strongly of chemicals and mildew. My house smells like fertilizer and mold from opening it. Customer service said this time that it is normal for the rugs to smell like that and it just needs a few days to air out. There is no way it should smell like that. Especially since the original rug came delivered perfectly. Overstock's quality control has clearly gone down over the years. I am super disappointed. Perfect fit for the space I ordered this rug for. Good quality for the price. Love this super plush rug that fits in our home so well. Got for a great price and received quickly within a couple days. Fairly simple design goes well with just about any decor. Looks exactly like the photos online! 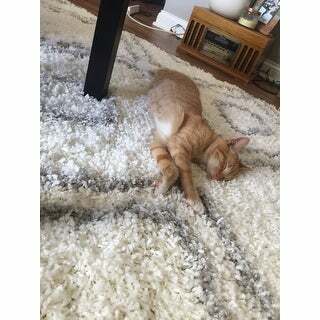 My animals might enjoy this rug more than we do! 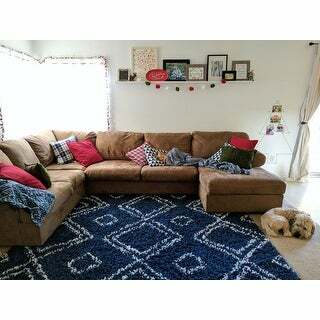 Will get all my rugs from Overstock!! Love this rug! Looks exactly like the picture. It is perfect for my client's home! This rug is super pretty but wish it was a little thicker. but really good rug for the price. The color is accurate to the picture and i love the design. the grey is a true grey. not brownish. overall love this rug. Great product! I love the pattern and the plushness. I just refinished my bedroom with wood flooring and ordered this rug for my queen size bed. 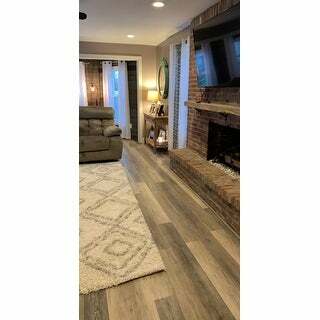 It looks absolutely stunning over the flooring and matches perfect to my wall color. The picture shown is what the rug actually looks like. The details are fabulous, and the fibers are deep. My toes are a happy camper stepping on to it first thing in the morning. "Does the White come in 3’ x 5’?" "Do you have this in a slightly smaller size? I'm more interested in 9 or 10 x 12." "Is the color really white?" Not true white but somewhere between winter white and true white. It's a pretty rug but if you are trying to match dead white, it might clash. "Is the ivory true ivory or closer to white?" It is a true white tone. "Is the diamond pattern on the rug easy on the eye (i.e. doesn't make your eyes hurt/feel weird looking at it)?" "How soft is this rug? Im looking at it to go in my nursery but I'm wanting a really soft rug." It's super soft! I think it would be perfect for a nursery!! I've had it about 4 months and love it!! "Is this a bright white or more of a natural/cream color? " It is more of an off-white tone.